SHO-ME 60 AMP ALTERNATING MULTI-LIGHT FLASHER. 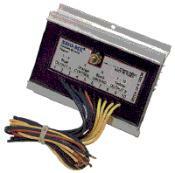 This 100% solid state flasher is ideal for multi-light systems. Lights flash 90 times per minute per side. Operates with almost any standard switch. Smaller size is more convenient to install. NOT for use with vehicle headlights. 12 Volt. Dimensions: 1 3/4"H x 3 3/4"W x 5 3/8"L. 2 year factory warranty. MADE IN USA.